Flash drive infections - this term can apply to infections spreading through any removable media and devices, such as usb flash drives or memory cards. Infections of this type take advantage of Autorun/Autoplay feature in Windows. AutoRun, a feature of Windows Explorer introduced in Windows 95, enables media and devices to launch programs by use of commands listed in a file called autorun.inf, stored in the root directory of the medium. AutoPlay is a feature introduced in Windows XP which examines removable media and devices and, based on content such as pictures, music or video files, launches an appropriate application to play or display the content. If available, settings in an autorun.inf file can add to the options presented to the user. How can you get infected? Pretty easily, that's why we have seen so many infections lately using this method to infect more and more computers or reinfect them easily if the system drive has been reformatted (for example Sality or Conficker worm). Your computer or removable device can be infected and you won't even notice that, unless you know what to look for. So, let's take a closer look. It tricks users to install or run a program - in most cases a malicious one. Clicking Open folders to view files under General options won't execute the code. However, you're not safe yet, unless you have disabled Autorun. A malicious program still can be run when you open the drive from Windows Explorer (either a removable drive or infected partition) - commands listed in an autorun.inf file will be executed - with your minimal contribution. It's well shown on the images on US-Cert's page. Note: autorun.inf files are not necessarily bad - they can be used for both legitimate and malicious purposes. Such files are also used on CD discs with programs or games - they will 'tell' system to proceed with an install of an application. Another example is the autorun.inf file used in the U3 platform. So, what is the solution? 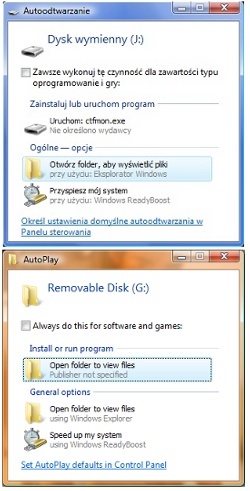 You just need to disable Autorun in Windows, so your system will ignore commands listed in autorun.inf files. You won't get infected unless you execute a malicious program manually. This update disables AutoRun entries in AutoPlay, and displays only entries that are populated from CD and DVD drives. Effectively, this prevents AutoPlay from working with USB media. It restricts AutoPlay functionality to only CD and DVD media on supported editions of Windows XP, Windows Server 2003, Windows Vista, and Windows Server 2008. In other words, it will work the same as in Windows 7: Improvements to AutoPlay. All you do is to copy these three lines into a file called NOAUTRUN.REG (or anything.REG) and double-click it. This hack tells Windows to treat AUTORUN.INF as if it were a configuration file from a pre-Windows 95 application. Another method, if only you have a Microsoft Windows update KB967715 or KB953252 installed (or KB950582), is to disable Autorun directly through the Group Policy settings or registry. 1. Click Start , type Gpedit.msc in the Start Search box, and then press ENTER. 2. Under Computer Configuration, expand Administrative Templates, expand Windows Components, and then click Autoplay Policies. 3. In the Details pane, double-click Turn off Autoplay. 3. In the Settings pane, right-click Turn off Autoplay (or Disable Autoplay in Windows 2000), and then click Properties. or in Windows Vista: click Start, type regedit in the Start Search box, and then press ENTER. 3. Right-click NoDriveTypeAutoRun, and then click Modify. 4. In the Value data box, type 0xFF to disable all types of drives (recommended). To selectively disable specific drives, use a different value as described in the "How to selectively disable specific Autorun features" section of this article. 5. Click OK, and then exit Registry Editor. One another method is to use any automated tool which can disable Autorun for us. - USB Vaccination - when applied on a USB drive (FAT & FAT32), the vaccine permanently blocks an innocuous AUTORUN.INF file, preventing it from being read, created, deleted or modified. Malware trying to get into your flash drive (or any other removable device) won't be able to delete that blocked autorun.inf file. So, even with malware files on the drive, infection won't spread - you can safely plug your flash drive into other computers. Autorun Protector is pretty similar to Panda's tool. With PC Protection enabled, Autorun is disabled - it uses the method presented by Nick Brown. Device Protection is similar to USB Vaccination - however, the method this program uses is better for drives with NTFS file system. According to Microsoft: You may notice a change in user experience for the drives for which Autorun is disabled. The double-click and right-click shortcut menu functionality might be different because the Autorun.inf file is no longer read. Theoretically, yes - with Autorun disabled you're pretty safe. However, there are at least two things to watch out for. Firstly, you can still get infected if you manually open an infected file (that's what antivirus programs are supposed to protect you against). Secondly, system may have cached Autorun information about devices which had been connected in the past - it will 'remember' what to do when that device is connected once again. Note: Autorun Protector has that option as well. Note2: That key will get recreated (cache will be cleared, though) after reboot.